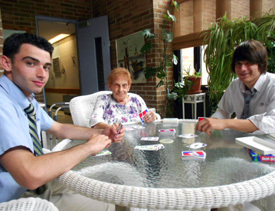 Our Home’s Residents love visiting with people – especially the youth! 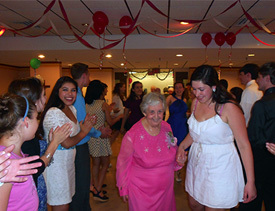 Children and young adults have a contagious joy and youthfulness that can be shared with the elderly. Whether you are interested in community service, learning more about the Congregation and vocations, or just looking to bring joy to the Residents’ days, we are more than happy to have you here! 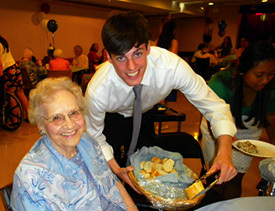 We have plenty of opportunities for children and young adults to spend time with the Residents. Many youth volunteers choose to help out serving meals in the dining room, help with holidays and special events, put on musical and theatrical performances, or simply sit to chat or play cards with a Resident. Many of our male volunteers spend their time playing billiards with some of our male Residents. You cannot imagine the pure joy that children can bring to an everyday activity! Young women are also encouraged to volunteer on their own time, according to their possibilities and talents. Any young woman who wishes to volunteer is welcome! The Jeanne Jugan Residence also partners with local schools, such as LaSalle Academy, to offer special events to our Residents. Please contact pwactivities@littlesistersofthepoor.org if you would like to develop a partnership program with the Home.